Author's note: While doing research on a genealogy site in Spring of 2009, I met a relative of Edith Evans, Emlen Hutchinson Evans. I asked 'Hutch' if he had any photographs of his relative. 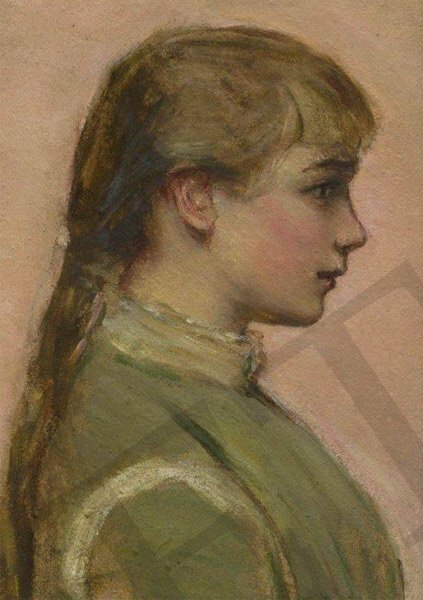 He did not own any, however, he had a beautiful pastel portrait of her, which was painted when she was a teenager. It was then that I decided to write an article that would feature her portrait so others may see what she looked like. There were rumors going back several years that a researcher had found a few photographs of Evans. These were eventually published in the Titanic Commutator a number of months after my article appeared in Voyage. I had hoped after that someone else might uncover new information regarding Edith following these two articles. To my surprise, a journalist named Andrew Wilson wrote an excellent new book called, Shadows of the Titanic which featured an amazing new piece of information. When I got to page 55, I was amazed to read that Edith Evans may have made it to collapsible boat A. George Rheims had informed Edith Rosenbaum (later Russell) that he was next to the woman while encouraging her to remain standing to balance the boat. However, she slowly succumbed to the cold and fell over dead and her body washed overboard. Wilson had found this information in Edith Russell's unpublished autobiography. This is held at the Maritime Museum in Greenwich in the Walter Lord collection. He kindly sent me the section relating to Evans. Edith Russell used the words 'thought to have been' when talking about the Rheims/Evans incident. Was Russell making the assumption or Rheims? What is known is that both Russell and Rheims had cabins close to Evans. It's possible they may have been acquainted or had seen each other in passing. Would Rheims have recognized a soaking wet Evans in the darkness of a waterlogged boat? What would make Edith Russell assume it was Evans? It is not the type of name a person would pull out of the air. It's tempting to think that when seaman Lucas called up to Evans and another woman, saying another boat was being put down for them, that a well-meaning crewman or passenger took her to the starboard side to see if it was true. Did they cross through the bridge or hurry back through the entrance to the grand staircase to get to the other side? We do know that according to steward Edward Brown, that four or five women were waiting to board collapsible A. He said that many people had 'scrambled' into it when the Titanic began to sink rapidly and they were almost all washed out. Again, all of this is conjecture, but it proves that anyone who says there is nothing else to learn about the Titanic, they are wrong. The dictionary defines the word heroine as, “a woman of distinguished courage or ability, admired for her brave deeds and noble qualities.” When learning about the Titanic, people become familiar with the story of Edith Evans, who sacrificed her life so that her friend may live. She has been a faceless name in books written about the shipwreck that describe her final acts. The Evans family can trace its roots all the way back to Wales and it's ancestor Mervyn Vrych, the King of Man who was slain in a battle with the King of Mercia. The first Cadwalader Evan, being born about 1613. Over the years, Evan became Evans and the family began migrating to Philadelphia. Cadwalader Evans was born in 1847 to Manlius Evans and Ellen Kuhn. He was one of several children; Hartman, Roswald, Rosalie and Ellen. The family settled in New York after 1860 where Manlius worked as a stockbroker. Cadwalader followed in his father's footsteps and chose this as his profession. He met Angeline Burr Corse, daughter of Israel Corse and Catherine Ketchum and the two married on May 28, 1872. Her family roots were equally impressive, being a direct descendant of Andrew Hamilton. 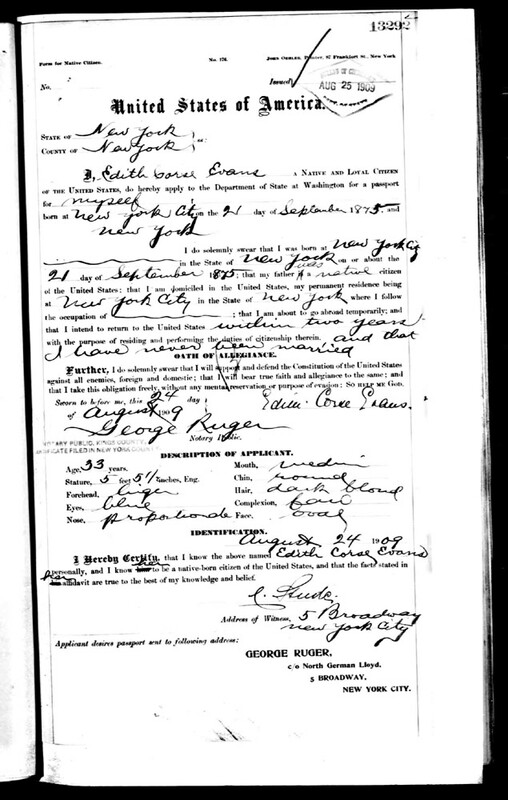 His wife was known as Lena, and so they named their first daughter Lena, who was born June 22, 1873. A few years later, Edith Corse Evans was born September 21, 1875. Unfortunately, Cadwalader Evans passed away of kidney failure in January 1880. The loss of her father at a young age showed Edith how fragile life could be. Certainly, she was made aware of a cousin of her father's named Gracie who was lost along with her daughter in the sinking of the Arctic in 1854. The specter of death at sea would no doubt be in the back of her mind throughout her life. The Evans family was very active in New York society whether it was attending meetings for the Colonial Dames of America or church. A bit of excitement occurred during her youth. She and her sister went through the blizzard of 1888. More than 400 people died, over 200 in New York alone. Carole Lindsay researched their involvement and found that Lena wrote an essay on their experiences. She said that she and Edith walked to school in “an enchanted city of trackless snow.” Their mother passed away in 1909. Edith decided to take a trip to Europe which included a stay with cousins in Paris, France. Also overseas were three sisters of her acquaintance, Caroline Brown, Malvina Cornell, and Charlotte Appleton. They were attending the funeral of a fourth sister. The sisters boarded the Titanic in Southampton on April 10, 1912 and several hours later, Edith joined them when the ship stopped in Cherbourg. Her cabin was A-29 and her cabin neighbor was Algernon Barkworth. Despite, the sadness of her acquaintances, Edith most likely enjoyed exploring the enormous ship and took part in maiden voyage revelrie. Another account has Edith being picked up by sailors, but requesting that she be put down and her friend being put in the boat first. A third account places them in the boat, but due to supposed over-crowding Miss Evans offers to wait for another boat and gets back on the boat deck. Mrs. Brown continued her account. Colonel Gracie was washed overboard as the ship went down and survived by straddling the upside down collapsible 'B'... When rescued by the Carpathia, he enquired as to what happened to his charges. To his disappointment, he found Miss Evans did not make it into a boat. He questioned officer Lightoller as to why Miss Evans, who stood right in front of the lifeboat, did not get on. Lightoller swore that all women were placed in the lifeboat. If this is true, what became of the other three ladies that followed Mrs. Brown and Miss Evans? Mrs. Brown sent a letter saying that Miss Evans last words to her were, “Never mind. I will go on a later boat.” She then left the area. Men still on the ship, who were later pulled from the ocean, were horrified to see there were women in the crowd. No doubt, a few of them caught a glimpse of Edith. The family soon arranged for a memorial service at Grace Church, on Broadway in New York City. Caroline Brown wept as she spoke these words to the congregration. “It was a heroic sacrifice, and as long as I live I shall hold her memory dear as my preserver, who prefered to die so that I might live.” A plaque commemorates her heroism. Another church, St. Ann's Episcopal Church in Sayville, Long Island also erected a tablet in her memory. The church organ was in memorial to her late father, Cadwalader. Her will was probated at over $10,000. A thousand of it was left to her goddaughter, Alice Lee Beadelston and also to Frederick de Puyster Foster. The remainder went to her sister Lena. The magazine Outlook published a pointed letter from the grieving sister around the time of the Gracie statement that Edith was not lost due to a “superstitious unwillingness” to leave the ship. She declared that her sister was lost because she insisted Mrs. Brown take precedence in boarding the lifeboat. As with any family, photographs get filed away and as the years past some are thrown away or lost. People have actively searched for any portrait of this elusive heroine. This beautiful pastel painting is courtesy of Emlen Hutchinson Evans and his brother, Allen Evans. Voyage is happy to present this unique find for all to see. When one looks at her profile, you can see how this teenage girl morphed into a young lady of courage who gave the ultimate sacrifice.